When a video made headlines last month appearing to show an Asian store manager pinning down a black customer he had accused of shoplifting, Hyepin Im’s heart sank. “I said, ‘Oh s**t,’” Im, president and founder of Korean Churches for Community Development (KCCD), a national nonprofit, told NBC News. For some, that cellphone video from inside Missha Beauty in Charlotte, North Carolina, rekindled memories of the 1990s, a time of tense relations between Korean store owners and black customers in cities like New York and Los Angeles. The incident also came a little more than a month before the 25-year anniversary of an especially dark episode in American history, one that pitted Koreans and blacks against each other — the Los Angeles riots. Those six-days of unrest, beginning on April 29, 1992, followed the acquittal of four white officers who were videotaped beating black motorist Rodney King after a police chase. The devastation was vast: over 50 dead, over 12,000 arrested, over $1 billion in property damage. Korean-owned property suffered between 35 to 40 percent of that destruction, according to research from the University of California, Riverside. While relations between Koreans and blacks have improved since then, community leaders say the work is far from done. “The challenges that lay ahead are overcoming myths, overcoming misunderstandings, overcoming the things that have really shaped our own ideas and our own philosophies that do not anchor themselves in reality but oftentimes borders on something that is innuendo,” Rev. “J” Edgar Boyd, pastor of the First African Methodist Episcopal Church of Los Angeles, told NBC News. Mistrust between Koreans and blacks had been brewing for years in a neighborhood no stranger to race riots. In 1965, the South Los Angeles section known as Watts had already been ground zero for looting and unrest. That violence came after a white police officer arrested a black motorist on charges of drunk driving. Meanwhile, Koreans had begun arriving in the United States in large numbers after immigration restrictions on Asian countries were lifted in 1965. As Jewish shop owners left South Los Angeles, Korean merchants stepped in to take their place. They began opening their own mom-and-pop stores in the 1970s, Boyd said, in a predominantly black community that had fallen on hard times. “African Americans felt the bite and the squeeze and the pinch of poverty in real serious ways,” said the 69-year-old Boyd, who was pastor of Bethel AME Church of Los Angeles at the time of the riots. “There became areas and moments of frustration and tension between those who were marginalized and those who seemed to be surviving — and surviving from the resources of those who were actually pinched and who were impoverished,” Boyd added. According to Im, myths about Koreans’ success in South Los Angeles helped to fuel an animus toward Koreans and Asians both before and after the unrest. Among the myths, she said, were that Korean and Asian store owners exploited blacks and stole business opportunities from them while earning a lot of money. At an April 4 Saigu prayer breakfast — “Saigu” is Korean for the date the riots broke out — Im said she presented data to a multi-ethnic audience to challenge the model-minority stereotype often applied to Koreans and Asians. A slide taken from a presentation given by KCCD. Using census figures from 2006 to 2010, her report showed that 31 percent of Asian Americans in the City of Los Angeles were considered poor. It also said Koreans had the lowest rate of homeownership in Los Angeles County and second lowest value of total assets held by households in 2015. “One of the things that is really sad is that for these store owners, they are in these communities because they are very much suffering from the same economic challenges, pretty much in the same economic wheelchair,” Im said. But some in the black community saw it differently. “And so I can see plainly how myths can develop...just from the person’s visual, casual evaluation,” he added. Further fanning the flames of discord between the two groups was a series of deadly clashes before the riots that involved Korean shopkeepers and black customers. One flashpoint came in March 1991 with the death of 15-year-old Latasha Harlins. Korean store owner Soon Ja Du fatally shot Harlins in the head following a scuffle over a bottle of orange juice she accused Harlins of trying to steal. Du got five years probation but served no jail time. Another happened in June that same year when Tae Sam Park killed 42-year-old Lee Arthur Mitchell. Park refused to sell Mitchell a wine cooler he allegedly wanted for 25 cents less than it was priced, according to the Los Angeles Times. A struggle ensued after Mitchell went behind the counter of Park’s liquor store to take money, the article said. Park pulled a pistol and shot an unarmed Mitchell five times. Park was cleared in the incident. And just a month earlier, two recent Korean immigrants working at another liquor store were shot to death after complying with demands from a robber whom police identified as black, the LA Times reported. Angered over Mitchell’s death, Bethel AME organized a boycott of Park’s liquor store, across the street from the church, Boyd said. It lasted 113 days, he said. Park eventually shuttered his business, and Bethel AME bought over the property, turning it into a community development center, Boyd said. It “was done in an act to bring some visible measure of satisfaction to the community that some recognizable, tangible process and progress was being made to the betterment of the community,” Boyd said. Meanwhile, as tensions flared between Koreans and blacks, all of Los Angeles and the nation was glued to another case with strong racial overtones — Rodney King. As timing would have it, Harlins, the black girl shot by the Korean store owner in March 1991, was killed one day after a county grand jury indicted four LAPD officers in King’s beating. Im blamed the media for connecting the two incidents. “That has nothing to do with the LA riots, with Rodney King, the police brutality,” she said of Harlins’ death. 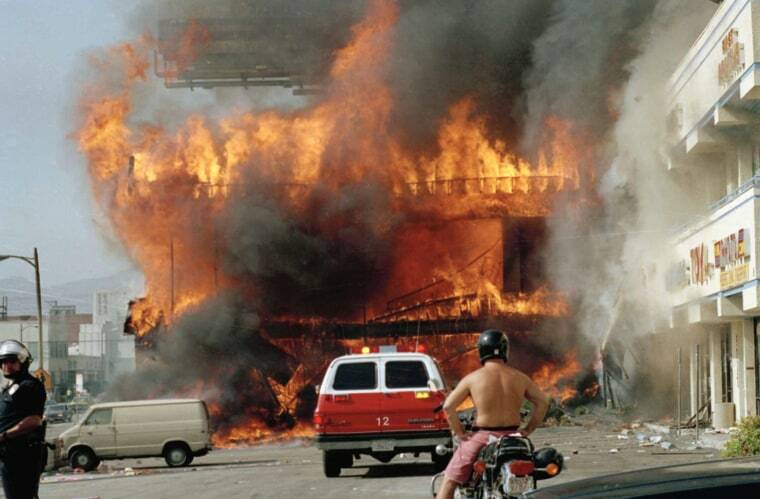 After a not-guilty verdict came down in the King case on April 29, 1992, Korean stores in South Los Angeles found themselves among those being looted, torched, and destroyed. Among the television images seared in the minds of Americans back then were those of Korean shop owners brandishing rifles and pistols, standing sentry outside their businesses, warding off would-be looters as the city burned. Boyd said there was a feeling among blacks that Koreans were taking from the community but not giving back. “From conversations I’ve had with a large number of African Americans, they felt that since those stores proliferated at a big percentage throughout African-American communities, that they would have been a bit more sensitive to the cultural needs of the community, of the social and economic needs of the community,” he said. That might’ve included hiring blacks or training them in merchandizing, among other things, Boyd said. Emile Mack, 59, can see both sides. He was one of the Los Angeles firefighters called to battle blaze after blaze as projectiles were hurled at them and as gun battles broke out between Korean merchants and looters. Mack is also of Korean descent — and an adoptee whose parents are black. Twenty-five years after that ignition point, groups in both the Korean and black communities — as well as the LAPD — have been working hand-in-hand to ensure something like this never happens again. To that end, Im said KCCD has partnered with groups across cultures, including the California African American Museum, Project Islamic Hope, and the Center for Asian Americans United for Self Empowerment. Today, Im said KCCD’s planning committee has close to 60 members representing a variety of organizations. For Im, heartfelt dialogue and debunking myths across different ethnic, racial, and religious groups are key to bridging the divides among communities, she said. “We definitely see it as a long-term effort,” Im said. For his part, Boyd said he believes discourse between Koreans and blacks is more constructive today than it was 25 years ago. Clergy from both groups frequently participate in councils, he said, and relations between Korean and black public school students have also improved. Since the riots, blacks have been able to own businesses in South Los Angeles, and banks have provided loans, Boyd said. “I think there’s a genuine intent on everybody’s part to look back and see the pain and see the death and the pathology that existed in 1992,” Boyd said. “Loss never benefits any body except the undertaker or those who come in and make a living to clean it up,” he added. An excerpt taken from a report by the Independent Commission on the Los Angeles Police Department. Policing in Los Angeles has also evolved, according to LAPD Commander Blake Chow, who was on the front lines of the unrest back in 1992. Following the riots, the Independent Commission on the Los Angeles Police Department found that a culture of excessive force largely pervaded the LAPD. That culture was exacerbated by officers with racist and biased views toward the people they policed and even their fellow minority officers, the report concluded. One big difference today is that the LAPD is much closer to the communities they serve, Chow told NBC News in an email. “Each community partnership is akin to a pressure relief valve,” Chow wrote. “Issues dealing with the police and community no longer build up like a pressure cooker, but we are able to work with the community to reduce that pressure. However, in recent times other parts of the country have witnessed flashbacks to the Los Angeles of the 1990s. Riots and looting broke out in Ferguson, Missouri, and Baltimore, Maryland, following incidents where black men have died during police encounters. In both places, stores owned by Asians were among those looted and destroyed, according to business owners.